This one appears to be a 1935 Legion. Movement is double date stamped 1934 and 1935. Watch is really clean inside and out, but somewhere in the last 84 years, the face was cleaned with really poor results, removing the majority of the white finish from the base metal. Mounted on a minty 1940's JB Champion scissor band as received. Case back is marked with S/N and "10K Rolled Gold Plate Bulova" with the Amer. Standard Shield. It appears the Legion was renamed Commander in 1936. 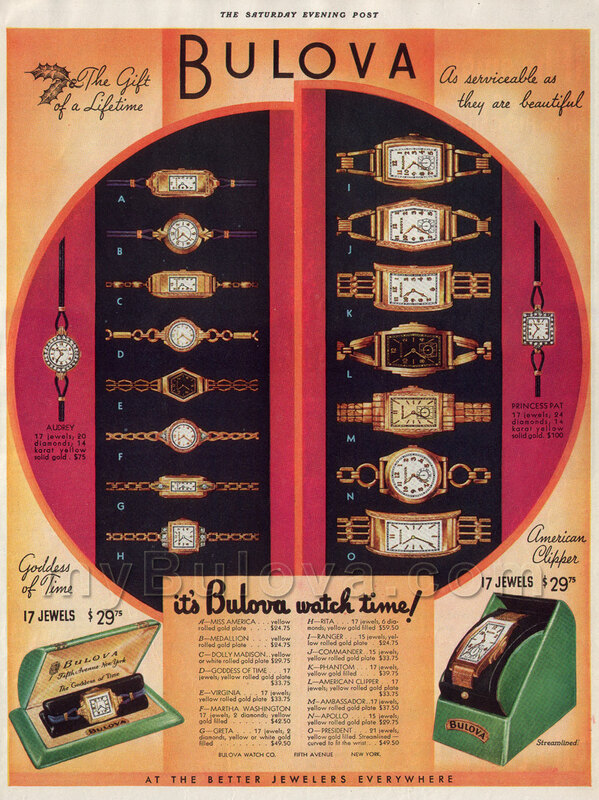 Here is an ad dated 1936 showing subject watch renamed as a Commander. Ad at top of posting is from the 1934/35 Annual Report. That is a neat watch. Too bad about the dial but it is still a great looking watch. Thanks Kathy, maybe some day I will have it redone. Actually, it really doesn't bother me, it reminds me of Cumulus clouds. Bob, if you are willing try a little soap and water with an old soft tooth brush, you may be surprised. It's the cut over period that I'm uncertain about. We have the Legion in 1934 and the Commander on 1936.....but which one was it known as in 1935?